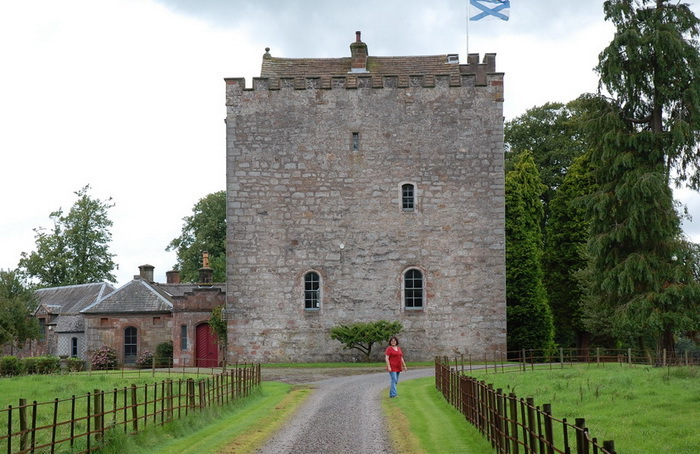 Me at Closeburn Castle, which is still occupied by Kirkpatricks! Technically, I think I was trespassing onto a personal driveway, but we just took quick pictures and left. I have been tracing my family tree and on a recent trip to Scotland managed to gather scads of material that I still need to sift through and enter into my database. However, there is a gap between our Kirkpatricks and the lords and knights of old. I think I have found the missing link, but it still needs some verification – hopefully I’ll find that in the above-mentioned scads of material. If my links are sound and we really are descended from the Kirkpatricks of old (a probability, as there weren’t a lot of them back then and theoretically we are ALL descended from them), then that also ties us in to a couple of royal lines. For instance, Euphemia de Bruce of the royal Bruce line of Scotland, married Ivone Kirkpatrick back in the 1200’s sometime. As well, Lady Margaret de Sommerville, who was a daughter of the Royal House of Stuarts, married Sir Roger Kirkpatrick in about 1508. 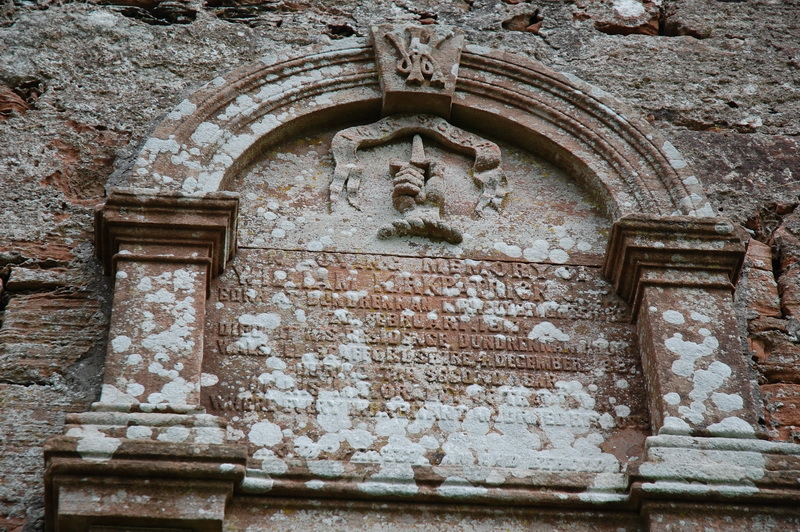 The Kirkpatrick motto on the last standing wall of the old Closeburn church. My trip was full of happy coincidences and at least once I said aloud, “These Kirkpatricks want their story told.” Maybe I’m just the gal to do it. This entry was posted in Family, Kirkpatrick, Real people and tagged Family-Research. Bookmark the permalink. Dawn, I found a post on ancestry.com and this post was from a Dawn looking for a Bernard Kirkpatrick from Nova Scotia. Might you be the Dawn that made this post? No, I don’t think that was me, Keith, but I am intrigued by my eastern Canadian cousins. I don’t know anything about them yet but I know we must be connected. Are you from that branch? I found your web pages by doing a Google search using: “Wallaces House, Kirkmichael, Dumfriesshire, Scotland”. This was the birthplace of Alexander Kirkpatrick, a distant relative of mine. Here’s a link to Kirkpatrick information that may interest you. I’m listed in the 9th Generation pages. 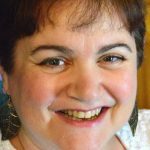 I don’t have the resources (time mostly) to research family history, but I’d be interested to know if you someday happen to find a link. I too have been to the Closeburn Church, Dumfries, etc, but the main research problem (for me at least) isn’t what happened in Scotland but what transpired in Ulster (Northern Ireland.) My Kirkpatrick ancestors emigrated to Pennsylvania circa 1730 from Ulster but before that all genealogical data on Kirkpatricks is a black hole due to a fire in the Irish Public Records House in 1922! I presume my ancestors came over from Scotland in the late 1600’s, stayed for a generation or two and then emigrated to America in 1730 but who knows? BTW are you familiar with the James Kilpatrick of South Carolina who, circa 1736, was the first doctor in America to use vaccination to prevent small-pox? Was he “your” James Kil/Kirk of SC? I don’t know for sure, but the timing sure is right! I haven’t had time to investigate James’ history too much yet. Can’t wait until I retire! My grandma is a Kirkpatrick, and a young 81. She is the oldest of 10 children. I have traced her family back 5 or 6 generations to Joseph Kirkpatrick (1838 to 1915). My grandma is from Baxter Springs, Kansas. I am not sure where the other generation came from, but would appreciate any help pointing me in the right direction. Good luck with your search. Hi Mickie Sue. Could you please elaborate with more details? I don’t think I have any of your Kirkpatricks in my database but I do have one Joseph Kirkpatrick from about that time frame. He was born in Maryland and Died in Ohio. I don’t have birth/death dates for him, though. If you could give me more details about what you’re looking for I’ll do my best to help! Hi there, closeburncastle. I believe in sharing information, so please feel free to share my picture. If you can link it back to my blog, so much the better. Since you’re looking into family history, this site may prove useful: http://www.jpkirkpatrick.com/Kirkpatrick/AlexanderKPDesc/b527.htm#P235 unless you’ve already seen it… Not all of the info has matched information I have from my grandmother (9th gen) but it has still given things to research. I’d actually be in the 11th generation on the site, but am not (yet) listed. Please feel free to contact me. Thanks Kylie! Yes, I have used JP’s site for a lot of my information, though I am also aware that the details may not always be accurate. Hi. Love reading the information. I find your research amazing. There is an old Kirkpatrick tale passed down through the generations claiming the Kirkpatrick’s were originally from Scotland and either fled or were banished after betraying The Bruce.This is when they migrated to Ireland. It is said that this is why our crest is a hand holding a bloody dagger. As I said it is a family legend, so not sure how accurate it is. My Kirkpatrick relations are mostly in Michigan now, but maybe you’ll find this information interesting. Hi Heather. Thank you for commenting! Glad you are enjoying my little blog, Starla. Thank you for commenting! I’ve been doing research on my mother’s side I believe her side are descendants of the Kirkpatricks because my relatives immigrated from the Isles. They’re Kilpatricks. I love the history of this place I actually just found a book on it. I love your email address, Jess. :) Thanks for your comments. We are probably cousins somewhere in the tree! Hey lets go to watties niche (spelling?????). I have been there with Tom Caulley and I must say it was quite an adventure, although Mr. Wallace was not home at the time. Ha ha! Sorry I almost missed your post, Joe. I was away on vacation for a little while. I have a feeling Mr. Wallace has not been home for quite sometime. I do plan to look for the old Wallace place next time I get to Scotland. Hello Cousin Bonnie, Hugh Kirkpatrick and Rachel Kelly are my 4th great-grandparents through their daughter Catherine. I have hit a wall in the Kirkpatrick line in the same place you have. If you’d ever like to reach out to me my email is just my first name and last name at gmail. I don’t really have any more information about the Kirkpatricks but I’d like to hear a answer to Hugh’s father if you ever find one. I’ve been researching the Kirkpatrick family since 1971 but took a recent 3-year holiday to write a book about the Bernard Family (one of my other grandparents.) Now, I’m back to the Kirkpatrick/Kilpatrick search. Has anyone found any new info to tie the Kirkpatricks of Pennsylvania to Northern Ireland whence they supposedly came circa 1730? Appreciate any info or guesses! Good morning, Douglas! I have not heard of anyone finding that yet. I would love to travel to Ireland to do some serious research but just do not have the time right now. Let us know if you find anything yourself. I agree that Ireland is the next best place to look. Hi Douglas and dawn Ann im from South Africa and I’m 16 now,but my dad and his dad are from Ireland so you correct in saying it traces back to Ireland, and there dads trace back to closeburn Scotland unfortunately the castle that my family traces back to is the one that burned down because of drunk servents in the 1700s. Right now my grandpa lives in Australia and my dad in South Africa. All of this information is from the side of the family with the burned down castle. Welcome, James in South Africa! Thanks for the message. Was the castle that burned down in Ireland or Scotland? Good luck with your research! My grandad traced himself back to William Kirkpatrick. The majority of our lot still live in Scotland barring myself sister and father. I don’t have much more info than that but it’s certainly interesting to read all of this. Thanks for commenting, Mitchell! What part of Scotland are you in? Back in 2008 I toured Scotland and stayed in Dumfries for a few days doing research. I love the country and enjoyed my visit very much! There is a great book available on Amazon called, “The Closeburn Kirkpatricks”. It has complete genealogical data…….. I just ordered and received it, and it answers lots of questions that I had. Hi, Dawn-Ann. I’m another likely relative … a direct descendent from James Kirkpatrick born in 1715 who emigrated first to Belfast as a boy of 10 in 1725 and then as a young man to the U.S. in 1736, arriving at New Castle Delaware. I’ve encountered the same frustrations you have, I’m sure, with some Internet and written sources having incomplete and even inaccurate information that is repeated and then taken as fact. For instance, I’ve had difficulty confirming the birth year of James’ son Francis (1735 or 1737) who married twice and had a son, John on April 24, 1787. I’ve also found conflicting information about James’ father, Alexander, who is buried in Basking Ridge Presbyterian Church cemetery in Somerset County, NJ. I know he died on June 3, 1758. His headstone states that he died at 61 years of age, which would place his likely birth in 1697, but other sources have claimed he was born in 1670 (which would have made him 88 at his death, which is extremely unlikely for that time period). In any event, if there are any reputable sources you can point me to, I would be very grateful! And thank you for your blog. I am a direct descendent of Adam Kirkpatrick (1772-1854) and Rosannah Patton (1777-1817) who were married in Harrison, Kentucky in 1797. I’ve found photos of their marriage bond and marriage records with Adam’s signature. I’m having trouble finding any information other than “probable” of who was Adam’s father was. I think (thought) it was Samuel Kirkpatrick (1739-1814) who was married to Margaret Dickey (1749-? ), daughter of Michael Dickey. Recently I found information that Samuel may have had a brother named Thomas who may be Adam’s father. And, that Thomas’ and Samuel’s father was also named Thomas and he was the original immigrant. Does any of this sound familiar to you? I would be grateful for any information. Many thanks. I should add that Adam may have been born in Pennsylvania or possibly in Augusta county, Virginia. I know he spent at least part of his youth in Virginia and moved to Kentucky before he married Rosannah. He died in Adams county Ohio and he is buried in Cherry Fork Cemetery.